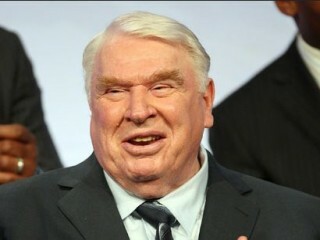 John Madden, a successful American football coach is a former American football player in the National Football League, which won the Super Bowl as head coach with the Oakland Raiders in the American Football League and later the NFL. Madden is also a former color commentator for NFL telecasts. In ten seasons as coach of the Raiders, Madden finished with a record of 103–32–7, no losing seasons and a Super Bowl victory in 1977. In 2006, he was inducted into the Pro Football Hall of Fame in recognition of his coaching career. He is also widely known for the long-running Madden NFL video game series he has endorsed and fronted since 1988. Madden broadcast with Pat Summerall in the 1980s and 1990s, on CBS and later Fox. He was also the last color commentator for ABC's Monday Night Football before it moved to ESPN in 2006. His last regular role was as a commentator for NBC Sunday Night Football. During his career, he worked as the main color commentator for all four major networks. View the full website biography of John Madden.